At about 9.15 a.m. on Friday, 21st October 1966, many thousands of tons of colliery waste swept with a jet like roar down the side of the Merthyr Mountain which formed the west flank of the village. 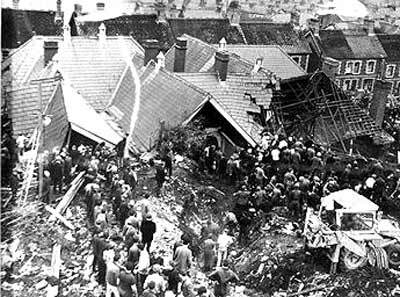 The massive force overwhelmed two Hafod-Tanglwys-Uchaf farm cottages and killed their occupants. It crossed the disused canal and went over the railway embankment. It engulfed and destroyed a school and eighteen houses and damaged another school and dwellings in the village before the dreadful flow ceased. The day had begun windless and sunny except for a belt of mist which filled the lower parts of the valley and prevented people seeing the tips. The men working above the mist could see to the top of the colliery stack. Lessons began at the junior school at 9 a.m. but at the senior school lessons did not begin until 9.30, so that while the younger children were already at lessons the older children were making their way to school. At about 9.25 a sound was heard being variously described as thunder or a low flying jet plane or loose trams running down an incline. 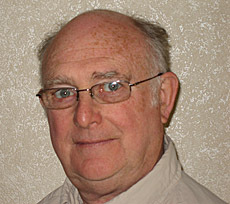 Howard Rees, a pupil at the senior school, was making his way up the Moy Road when he saw a big wave, much higher than the houses, heading straight towards him. He could see trees, boulders trams, slurry and water in the flow and it appeared to him to be "moving as fast as a car". This mass hurled itself against the two schools and the houses which stood between them. Outside those houses three of Howard's school friends were killed while sitting on a wall. He saw them buried, crushed and killed. Howard and other boys were more fortunate even though they were hit by flying material. At the same time a hairdresser, Mr. George Lewis was making his way to his shop in Moy Road when he heard 'a noise like a jet plane' which he thought came from the tip. He could see nothing because of the fog but soon saw windows and doors of the houses on Moy Road crashing down like dominos. He was struck by flying material and would have been buried if it had not been for a piece of corrugated sheeting which acted as a shield until he was rescued by some Council workmen. “I heard a sound which appeared to be like a jet plane screaming low over the school in the fog. Immediately following there was a bang and the part of the school I was in shook, and some girls came running and screaming into the hall. When passing the Needlework room I noticed that the furthest corner had collapsed and the roof had started to collapse into the room as well. 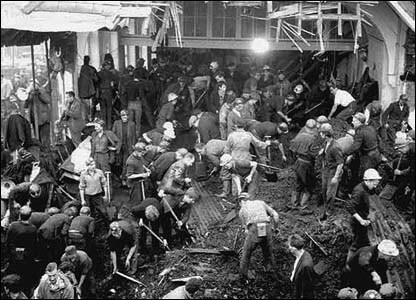 The Girl's entrance was approximately two thirds to three quarters full of rubble and waste material. I climbed onto the rubble in the doorway. I was still looking for this plane and when I look directly in front of me I saw the houses in Moy Road had vanished in a mass of waste tip material and that the Junior School gable ends or part of the roof, were sticking up out of the morass. I looked down to my right and I saw that the Moy Road houses had gone. Around the outer edge, near the school, where I was standing, it would have been firm enough to stand on. I was standing on the outside edge." Fechan Water Board which had been laid in the bed of the disused canal and which were severed in the slide. These pipes came from the Brecon Beacons and although they were turned off it was not until 11.30 p.m. that water stopped coming from them. The gang of men working at the top of the tip had arrived there shortly after 7.30 a.m. but their charge hand Mr. Leslie Davies was not with them at that time because it was Friday and he had to give his weekly report to the Unit Mechanical engineer, Mr. Vivian Thomas, down at the colliery. When Mr. Gwyn Brown, the crane driver and Mr. David Jones, a slinger, arrived at the point of the tip they found that it had sunk by 9 to 10 feet and that two pairs of rails, forming part of the track on which the crane moved, had fallen into the hole that was left. Mr. David Jones set off down the mountain with a message as the telephone that had been at the top of the tip had been removed because the wire to it had repeatedly been stolen. While David Jones was on his way down, Mr. Glyn Brown used the crane to recover the tram landing plate from the hole and then with the help of others in the gang, he moved the crane further back from the edge of the tip.